You are new to the sport and want to try out clipless pedal? There are so many brands like Shimano, Fizik, Specialized that make it hard to choose the right shoe. Do you need a $400 shoe as a beginner? The answer is no. Thats why we compiled the top 5 beginner road bike shoes that won’t break the bank and still deliver top performance for you. If you are short on time: These are our favorites of this category. Check this page if you want to know to how to ride clipless pedals. The sleek shoe is equipped with three hook and loop straps for quick closure and adjustments that will lock your feet into place and guarantee optimal power transfer to your pedals. The shoes are also comfortable if you have wide feet. A molded heel cup will keep your heel from slipping and the reflective heel tab will keep you visible in dark conditions. These shoes are compatible with Look, SPD, SPD-R & SPD-SL cleats. The cycling shoes are sized with EU sizing conventions, please keep that in mind when you order. If you are between sizes, please choose one bigger. We recommend to wear SPD-SL cleats available here. 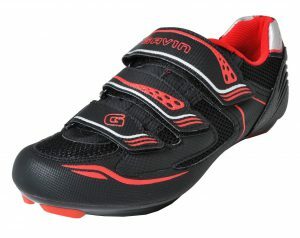 The Giro Savix is one of our personal favorites in the beginner category. Giro is a respectable brand and the Savix will deliver exactly what you expect. The upper sole is perforated to allow breathing and has microfiber and mesh that forms to your foot. The shoe has a Boa L6 closure dial which allows a “set and forget” and is easily adjustable and even while you are riding your bike and feel the need to tighten or loosen your shoe. A velcro strap secures the front part of your foot in place. If you have wide feet we suggest sizing up half a size, as they are quite snug and might be uncomfortable for you. The shoe is compatible with all common types of cleats but we recommend SPD-SL cleats. One of the more stylish shoes in this category is the Fizik R5. Fizik is known for their sleek and simple design. But also are loved by pros and amateurs alike for their comfort and power transmission. 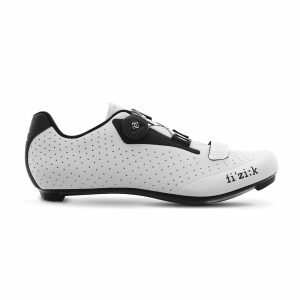 Its the entry level shoe from Fizik that inherits great features from the Fizik R1 and R3. It has a Nylon sole with carbon reinforcement that’s lightweight and yet super stiff and durable. The shoes stiff outer sole is absolutely critical for steady power transmission and maintaining optimal technique while pushing out watts. 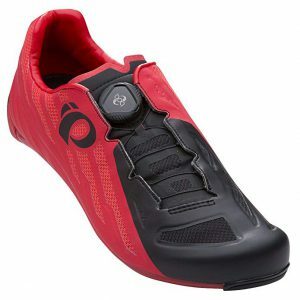 This popular shoe from Pearl Izumi features absolute stiffness while providing a very comfortable ride. A unique Bi-Directional Boa L6 closure system pulls laces from left and right to ensure even tension from both sides across the foot. That will leave you with very very comfortable pressure all around. It feels absolutely sleek and fast. If you like feeling like a pro these are the ones to go for. The road v5 is our most expensive choice for beginner shoes but we think they are worth it. The shoe is made of a breathable 3-Layer Seamless Composite upper that will avoid so-called hot spots. The road v5 is compatible with all 3-hole and SPD cleats. You can find them right here. The Velcro strap equipped Diamondback Century features durable synthetic leather and a breathable mesh upper to make sure your feet can breathe while on the bike. The nylon outsole is also equipped with venting holes. A soft spandex liner and a washable EVA insole improve comfort. This is an absolute bang for the buck as the feel much more expensive as they are with a price tag under $100. 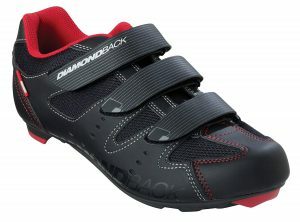 The Diamondback Century is usable with 3-hole cleats and SPD. Find them right here. Read this article on what to look for in your first pair of road bike shoes. Previous Post:How do I learn to ride with clipless pedals?